Mountain biking time-and-time again proves to be one of the most exhilarating and accessible ways to enjoy the scenic Arizona wilderness– not to mention the bonus of bragging-rights that accompany all feats of pedal-powered travel. However, to ensure that a trip reaches its full potential, it’s important to pack and prepare accordingly. 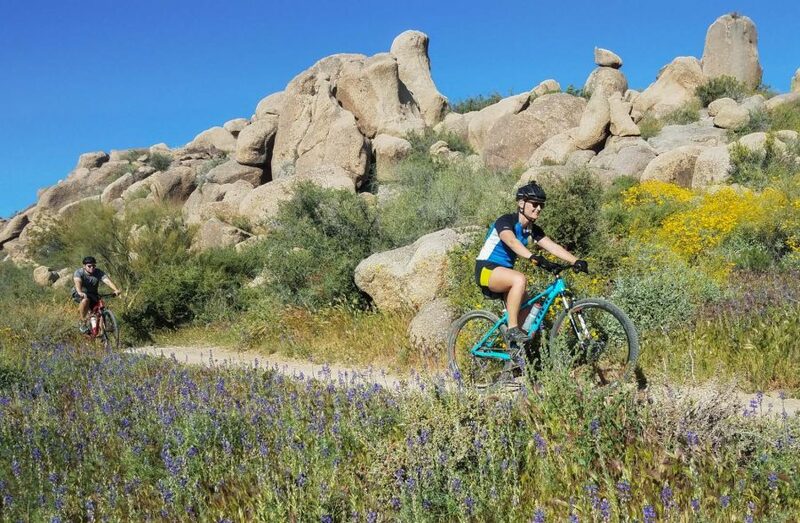 One of the most well-known rides in the state is the Arizona National Scenic Trail, which allows riders more than 750 miles of rugged dirt trail and all breathtaking the views that accompany it. If this trip seems too daunting in its entirety, consider breaking it up into a smaller journey by just biking a portion of it. Flagstaff and Sedona are also two of the most popular destinations for mountain biking, and their shorter loop-style trails allow riders to bike during the day and enjoy the city at night. When choosing a route, it’s important to remember the uniqueness of mountain biking that makes it so special. Although it may seem efficient to load days up with lots of miles and speed through, an important aspect of mountain biking is enjoying the beautiful red-rock scenery and all the critters that inhabit it. It’s also important to consider the abilities of every rider within the group, no one wants to fall off of the pace or exert themselves to the point of complete exhaustion to keep up, so be sure to run the proposed route by everyone before fully committing to it. AOA offers a multitude of different options for all levels, and with the added benefit of an experienced guide, it’s completely possible find a route that satisfies everyone– from daredevil to novice and everything in between. If you’re lucky, you might see snow on Four Peaks in the winter during a mountain bike tour with AOA. For most, biking necessities often only consist of a helmet and well, a bike. And while those two things are indeed still necessities, mountain biking, and specifically in Arizona, requires a slightly longer packing list. The Arizona climate is well-known for its scorching days while cooling off during the breezy nights. Because of this, it’s a good idea to pack a lot of moisture-wicking layers– including lighter ones to be worn during the day, and slightly thicker options to wear at night. Also, keep in mind that a light yet durable pair of shoes (flip-flops, Chaco’s, Crocs) would be a good idea to pack for milling around camp, as this would let the athletic biking shoes air out after a sweaty day on the trail. Other good options for clothes include a hat, sunglasses, multiple pairs of socks, and plenty of pairs of padded cycling shorts. It can often be difficult to pack everything you need but there are plenty of options available, for example, Yakima have a large selection of gear packing solutions that are great for a range of different environments. Like on any camping trip, hygiene and personal care are essential to making sure that the body is able to keep in peak shape. For mountain biking, the list doesn’t differ too much: sunscreen, chapstick, a headlamp, and water purification (Iodine pills, water pump, Steri-pen). Although water bottles are usually the norm for backpacking, most bikers prefer to use a bladder inside their backpack because they hold more, and can be accessed through a nozzle while still pedalling. It’s also important to consider all of the tools and spare parts needed to be packed in case some on-the-trail repairs or replacements are needed. Some of these include: spare tubes, a patch kit, compact bike pump, a multi-purpose tool, and a chain breaker. Mountain biking trails are often well-maintained, but are in their nature rugged and rough– so it’s important to prepare for any situation that could arise. All of these items can be bought at a local bike store, but if renting equipment, make sure that all of these items are included in the package. AOA ensures that guides have all of the equipment they may need, and because of their expertise they are also incredibly well-versed and knowledgeable when it comes to using it. The Catch-22 of packing: It’s important not to over-pack for any trip, but when everything packed is somehow strapped to the body, it becomes even more essential to pack only what is needed. Due to the unpredictability of weather, equipment, and proximity to civilisation– it’s crucial to use good judgement and previous experience when getting everything in order. AOA has lead countless successful mountain biking trips, and through their proven track-record and experience they’re able to make sure everyone has all the needed comforts while keeping the bulk to a minimum. Now that you know how to pack for a mountain bike trip, get your guide to four iconic mountain bike trails of the Southwest.